Chaco Culture illustrates the architectural and engineering achievements of the Chaco Anasazi people. The Chaco were an autonomous group within the Anasazi, the dominant native people within the US southwest between 300 and 1500 AD and the ancestors of the modern Pueblo peoples. 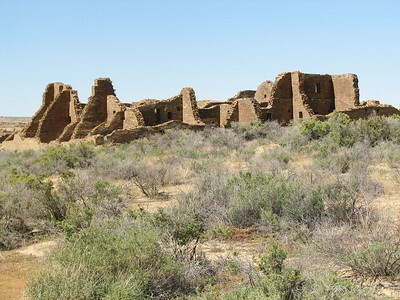 The Chaco formed agricultural communities with towns, villages and a road network in what is now northwest New Mexico. From 800s the characteristics of the Chaco culture became to appear here in the 10 mile long Chaco Canyon. The great houses (public buildings) of Pueblo Bonito, Una Vida, Hungo Pavi and many more were constructed. The zenith of this culture was from 1020 to 1100: leading to more roads, extensive trading, complex social structures. 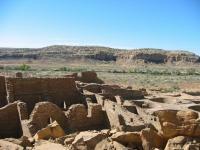 The Chaco population had died out in 1200, or migrated north and assimilated in other groups. 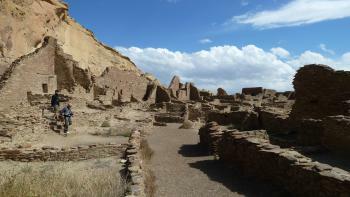 The route from Sante Fe to Chaco Culture National Historical Park is easy. First the I-25 south, and then Highway 550 at Bernalillo. The 550 is another long road with not much to see. From the well-posted highway exit it takes another 21 miles, 14 of them on a dirt road. It's really remote out here, I wonder if there are other tourists around. After about 45 minutes bumping up and down I arrive at the Visitor Center. A few other people clearly have made it out here too, as there are already some cars in the parking lot. At an entrance fee of 8 dollars per car you can take a roundtrip of 9 miles through the valley and along the points of interest. 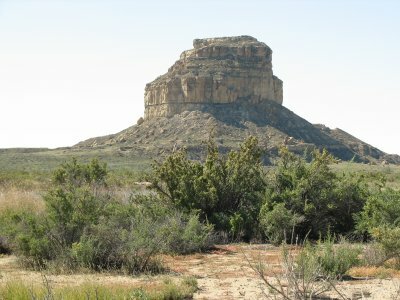 The impressive Fajada Butte marks the entrance to the park. But I start with the short walk to Una Vida. This is a mostly unexcavated great house. It's the most eastern of all public buildings in this region, that were connected by a road network. I pick up a booklet at the start of the walk which points out the most remarkable features. The walk has a length of 1.6 miles, and is a very enjoyable one in the relatively chilly morning. The highlight for me is the group of petroglyphs you can see on the rock just above the house. I drive on to the next stop: Hungo Pavi. Here the walls are in a good condition. The Chaco were very skilled brick layers. Archeologists can deduct from the way the bricks were layed from which period a building originates. These buildings could become 3 to 4 storeys high. At the end of the valley there are the two most complete ancient buildings, Chetro Ketl and Pueblo Bonito. Both are large building structures with about 500 rooms. Using another great booklet that you can buy for a mere 75 cents I walk the trails around and partly through these monuments. All kinds of pretty details are highlighted, like the little round holes in the rocks where the houses were attached to by wooden beams. There also used to be balconies at Chetro Ketl. Pueblo Bonito was hit by a large rock in 1941 (you can still see this), but there's a lot left: the central square and the low doors between the various rooms or apartments are clearly visible here. Only about 2000-6000 people lived permanently in the Chaco Canyon: it's difficult to survive in this dry high-desert valley. Most of the buildings probably only had religious or commercial purposes. After a very worthwhile visit of 4 hours (and having seen only part of the park) I concluded my trip at the Visitor Center where I watched a video about the astronomical knowledge of the Chaco. I learned from it that the walls of the great houses were built on exact north-south lines and that astronomical markers were placed on Fajada Butte. Much more mystery remains (also because of the lack of a written script), but Chaco Culture is a truely great site and a very worthy WHS! I’ll admit it; this was the site in the South West that I was visiting purely because I was in the area rather than because I had a strong desire to see it. Well I’m happy to report giving it such a low billing was entirely wrong, the magnificent ruins here were a distinct highlight of the region. I wasn’t expecting the ruins to be so extensive, so large or of such eminence; the brick work really is astounding. The quality of the remains far out-strips even the high points of Mesa Verde, reflecting that this canyon was the centre of a civilisation as testified by it being the hub of a unique road system. Like Els, we picked up the really handy booklets at the start of each trail which provided a wealth of information. The distinct highlight was Pueblo Bonito, which is a complex hive of rooms and inter-locking kivas. There was something so compelling about the settlement; it was endlessly intriguing trying to puzzle out the relationship between the different structures. And being able to duck off and get lost in the maze of rooms really brought out the little boy in me. 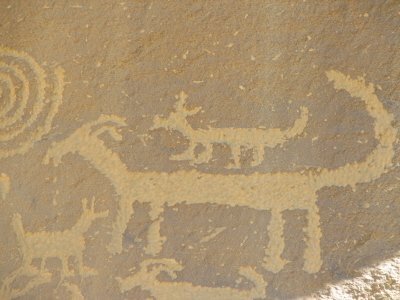 Though this was the highlight, the other groups of ruins were also well worth the time to explore and the trails of Petroglyphs bought yet another aspect to this wonderful site. We spent the night before our visit at the little ‘town’ of Cuba in the friendly Frontier Motel (if you want an authentic US motel experience look no further). After a diner breakfast of one of my new favourite dishes Huevos Rancheros we set off. Part of the fun of the site is getting there; the bumpy dirt track from the main road was rather entertaining to drive on, even if I did wonder about the well-being of our little car. After bumping back to the highway we headed off for a rather tasty meal and even tastier IPA at the recommended Three Rivers Brewery in Farmington. I really enjoyed this visit; the experience of the trip made it even better. From bumping across dirt roads to exploring a corner of the US that doesn't feature on many must-see lists. However it is the sheer quality of the masonry and the complex nature of the ruins that really make this place stand out as a great World Heritage Site. Chaco Canyon (CC) is one of those sites that could take a life-time of research, interviews, reading, and visiting to even begin to comprehend. Learning just a bit will remind you of how little you knew about this WHS previous to that. Engage in lots of reading and studying prior to a visit. Find someone who knows something about the area and pick their brains beforehand. There is so much to see, but you have to know what to look for and where it is located. To that end, go to the Visitor Center and get a back-country hiking pass. The car loop does not really let you see what is there. Get a good park map, and hike (where it is legal to do so, of course). I also highly recommend the book "Anasazi" by Frank McNitt. It is in print through University of New Mexico Press. It is the biography of Richard Wetherill. Opinion is extremely divided as to his legacy, as most anything to do with Southwestern archaeology usually is. However, I think the professionals' dim view of his work stems mainly from jealousy. Wetherill tended to get their first because he was willing to take the risks. The academics back East waited for him to do the locating...that's my interpretation at least. Take plenty of water and food. There is not a whole lot out there. European visitors need to be especially aware of this. This is not like hiking in the Cotswolds, or from one village to another in the Middle Rhine Valley. 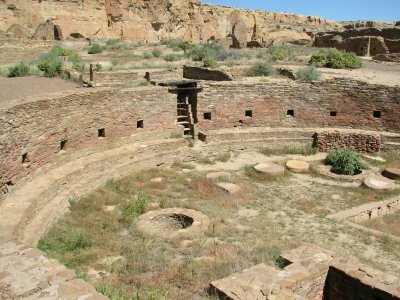 Chaco is one of many great Puebloan sites scattered throughout the Southwest. I enjoyed my visit here in May 2010. The complex of sites are large and spread out within the canyon. Half a day is appropriate to see all the sights (full day to see all components). 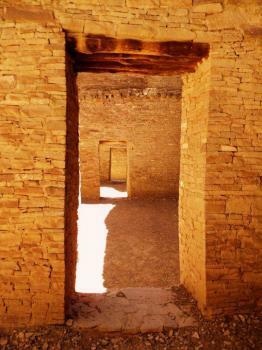 The exceptional passageways, doors, and kivas are some of the best preserved anywhere. Aztec National Monument and Salmon Ruins are not too far away, and are directly related to the Chaco culture. Both are part of the Chaco Culture world heritage site, it is probably worth stopping. Unfortunately, on my way back to Cortez, Colorado my fellow travellers had to get back home, so a short stop at the Aztec Ruins NM was not possible. There are numerous ancient puebloan houses, cliff-dwellings, "modern" pueblo's (Zuni, Taos), and old missions in Arizona, Colorado, and New Mexico. There are so much in fact, it may deserve another place on the world heritage list (or extension). Wuptaki National Monument near Flagstaff might be considered an outstanding site. Zuni Pueblo stands out as perhaps the only comparable site to Taos. Bandelier and Petroglyph National Monuments are on my travel itinerary. The region is incredibly rich in Native American living and ancient cultures, and if time permits I would highly recommend expanding your travel itinerary beyond only world heritage sites. Previous reviews have thorough historical information about Chaco Culture, so I will focus on logistics and what not to miss. I went with a group of five plus our wonderful tour guide, Mo, out of Santa Fe. It is a 3-hour drive from the city and very much worth it. I enjoyed hiking at Una Vida, particularly to see some very clear petroglyphs. Chetro Ketl and Pueblo Bonito were my favorite sites, particularly the latter because of our park tour guide who took us through there. He was very knowledgeable about Chaco and had been working at the park for 10 years. What drew him to the area was the gathering of fellow astronomers, who gaze at the clear night sky because there's no light pollution. It can get very hot at Chaco Culture. I was happy that Mo told us to bring a light long-sleeved shirt to protect us from the sun. If you plan to travel from Santa Fe, I highly recommend going with Mo's tour group. You can find more information at www.swadventures.com. I wouldn't drive to Chaco myself, especially on the washboard road from the highway leading into the park. Also make time for the gift shop, as it has wonderful books and other high quality souvenirs. Beside the gift shop is a small museum, which is also worth a visit. I especially liked the diorama it had of what Chaco Culture could have looked liked when it was inhabited. It gave me a clearer idea of how the present-day ruins would have once functioned. I lived at the Pueblo Alto Trading Post (Run by a man named Tanner who flew a Cessna 175 in and out of the area from Farmington) in 1967-68. I played football with a group of missionaries in what was then called the Chaco Canyon's Ruins (we actually played in the wash on the sand). At that time we say what appeared to be mearly inches of what must have been tops of walls at that sight. I do remember that up higher on the north side, there was a ledge so to speak - where a huge water basin was shaped out of the rock (approx 15-25 ft wide by no more than 4-8 ft deep. If you remember this "oddity" we are talking about the same sight. I'm told road from the North is better; porpoising washboard road on reservation includes sudden drops that _can_ have a cow in them for omigod entertainment. Note wide shallow dams to channel rare fierce floods from mesa to fields. P. Bonito's later construc. tells us where Mesa Verde folk went during drought c. 1200 a.d. & trade goods, e.g. bright feathers, show connection to Aztecans. Bring food, water & hiking togs, devour info for sale there. A Valhalla for digger anthropologists. Amazing that thousands could live here; an outstanding study in sustainability. The park features a large collection of ancestral puebloan ruins, including the massive Pueblo Bonito. This structure is believed to have been four stories high and contained over 600 rooms and 40 kivas (ceremonial round rooms). Pueblo Bonito was easily accessible from the main road in the park and the guided tour was very informative. More challenging trails to other sites in the park require a permit, and since we were only camping at the park for one night, we didn't have time to go. A wonderful extra benefit to visiting the Chaco Culture site is that it has very dark skies, due in part to the park's active commitment to reducing light pollution. This makes it very popular with the local astronomy community; in fact one local astronomer has donated a domed observatory and other equipment. The park has regular astronomy programs, which we were able to enjoy the night we were there. One presentation did an excellent job of showing the connections between astronomical cycles and the structures, as it is believed that the Chacoan people were observers of the skies themselves. For example, strategically placed windows in the buildings capture the sun at key times of the year, in order to track events such as the solstices. This part of the Chaco experience was a real treat for my husband, as he is an amateur astronomer himself. The volunteers that evening let him help find things with the telescope and show them to other park visitors. If you can stand the heat and the bumpy road to get in, Chaco is a very rewarding experience. I do have a few pieces of advice, though. The campground does not accept reservations and only has about 50 sites, so it's best to arrive by mid-afternoon to get a good one. Also, if you need firewood you should get it well in advance. There are few opportunities within an hour or two's drive of the site to purchase it, and none is available in the park. We almost had to do without, but the previous occupants of our campsite had extra and left it behind (thank you, whoever you are). This is a wonderful place to visit, full of gorgeous vistas, hiking opportunities, and many chances to just sit back and think about what a structure like this means. As I remember, the gravel road we took to get to Chaco was long and bumpy, but not outrageous. They have a nice visitor's center that explains a lot of the history of the area and Chaco itself. Bring water with you - and a camera and journal. I would love to return and camp there - to witness Chaco at night would be amazing! From "Chaco Culture National Historical Park" to "Chaco Culture"
Archaeological 'Type Sites': Basketmaker III Culture. In 1927 "Frank H. H. Roberts excavated the pithouse village called Shabik'eschee. This site pre-dated the period of the construction of Chacoan great houses (monumental public buildings), and became the archaeological "type-site" (example) for the Basketmaker III period in the Pecos classification of Pueblo cultures"... "it is located on the lowest terrace of a finger of Chacra Mesa at the east end of the current Chaco Culture National Historical Park." Pueblo Bonito "is the type site for the Bonito phase (about A.D. 860 to 1140)"